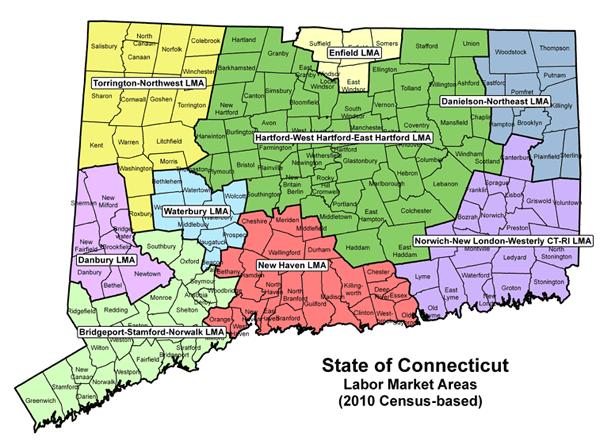 Quarterly Census of Employment and Wages program produces a comprehensive tabulation of employment and wage information for workers covered by CT Unemployment Insurance. Data on the number of establishments, employment & wages are reported by industry for state, county, town and labor market areas. Search for Torrington - Northwest employers by industry, occupation or company name. Find the largest Torrington - Northwest companies. Click on a company name to view more information about an employer. Data provided by InfoGroup®. LAUS produces monthly employment, unemployment and labor force data for Census regions, divisions, States, counties, metropolitan areas. A major source of labor force data estimates, survey includes a sample of over 1,600 households each month regarding the status of their occupants. 031: Canaan, 039: Colebrook, 041: Cornwall, 065: Goshen, 088: Kent, 094: Litchfield, 108: Morris, 132: Norfolk, 134: North Canaan, 156: Roxbury, 158: Salisbury, 162: Sharon, 183: Torrington, 190: Warren, 191: Washington, 210: Winchester.